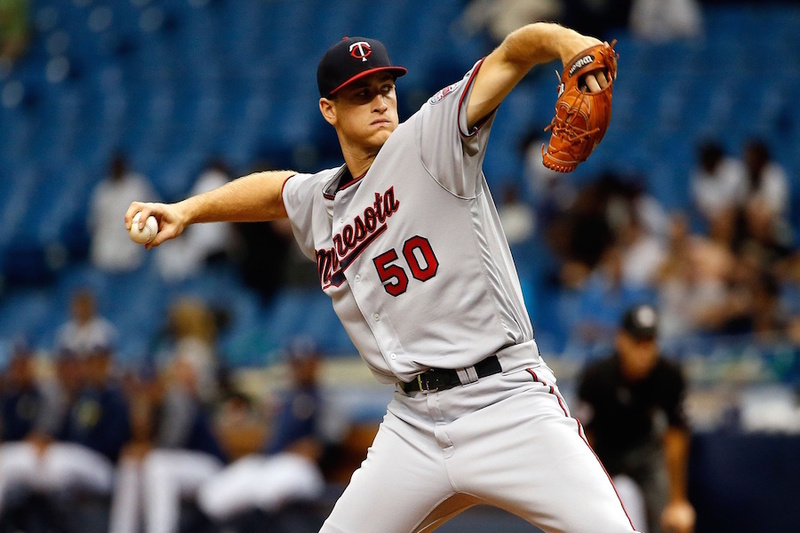 Who is going to help move the needle for the Twins rotation? We know it won't be Shohei Ohtani. It probably won't be Phil Hughes. The Rochester rotation is overflowing with potential reinforcements. And I don't mean the types of Quadruple-A journeymen that have often occupied the Red Wings ranks in recent years. We're talking legitimate prospects, ready to help. Much can change between now and spring training, but as things stand, one would expect at least these pitchers to be tentatively slotted for the Triple-A rotation: Aaron Slegers, Felix Jorge, Dietrich Enns, Stephen Gonsalves, Zack Littell, Fernando Romero. That's six, and I can't see much of a case for sending any of them back to Double-A. Maybe Romero, who wore down in August and didn't make it through the whole season with Chattanooga, but when healthy he was dominating hitters at that level, so even if he starts there it probably won't last long. Then there is Kohl Stewart. It's possible the former first-round pick, left unprotected for next week's Rule 5 draft, will be taken by another team, but that seems really unlikely. While his pedigree is pristine, the 23-year-old hasn't sustained any kind of success above Single-A. It wouldn't serve him, or his new team, to stick him in the back of an MLB bullpen. If he sticks around, it further complicates things. He has already made 32 starts at Double-A. It's sink-or-swim time at Rochester for him, but as things stand, the pool is full. And that's before we account for any other circumstances, such as Trevor May and/or Hughes needing to open in the minors to build strength, or Adalberto Mejia requiring a bit more seasoning. Looking at this impending logjam of arms, a few particular questions come to mind. I'll unpack them a little here, and then I'm curious to hear your thoughts in the comments. 1. What to Make of Aaron Slegers? To me, Slegers is a particularly interesting case as we look ahead to 2018. With relatively little fanfare, he has stayed healthy and climbed the organizational ladder since being selected as a fifth-round pick out of Indiana University in 2013. Though he's never achieved impressive strikeout rates, the 6'10" righty has consistently put up good numbers with a 3.50 ERA and 1.19 WHIP in 600 minor-league innings. As you may recall, Slegers got his first taste of the majors this year, pitching brilliantly in his MLB debut (6.1 IP, 2 H, 2 ER) and then struggling in three September appearances. The 25-year-old appears big-league ready, and while he doesn't produce the velocity or whiffs you'd like to see from his sky-scraping frame, there are some things to like about him. Chief among the positives is his ability to locate. Control is often one of the last things to come along for big lanky throwers like Slegers, but he has been exceptional in this regard ever since joining the pro ranks. This has been a huge part of his success in the minors, and could give him a reasonably high floor as a big-leaguer. Unfortunately, the ceiling isn't so high unless he can find a way to miss more bats. But here's an intriguing nugget: In his second start back at Rochester following his August 17th debut with the Twins, Slegers tied a career high with 10 strikeouts, inducing a whopping 20 swinging strikes. In his next start he once again struck out 10, this time with 15 whiffs. The total of 35 swings and misses in two successive starts is an impressive feat, especially for someone with his track record (Jose Berrios, who's made 30 total starts at Triple-A, has only surpassed that number in consecutive starts at the level once, when he tallied 36 in late 2015). And that was the last we saw of Slegers at Rochester. I'm very curious to see if he can pick up where he left off, and what type of untapped potential might lie in him yet, especially if he returns to the Twins and jibes with new pitching coach Garvin Alston. 2. Is It Time for Any of These Hurlers to Make a Bullpen Transition? As we know, the Twins need help in the bullpen as well as the rotation. And as we also know, many of the best relievers in the game are former starters who switched roles somewhere along the way. Several of the pitchers in the mix we're discussing here are somewhat fringy. So is it time to consider proactively sliding one or two of these guys into relief, with hopes of upgrading their stuff and accelerating their paths to major league impact? This would potentially help alleviate the rotation logjam, but the problem is that it feels too soon to give up on any of these guys as starting pitchers. The only one I could really see it happening with right now is Enns, who has fluctuated roles quite a bit in his pro career and dealt with shoulder inflammation late last year. 3. Could Someone Sneak Into the Opening Day MLB Rotation? This would be another method of thinning out the crowd, but again, it seems very unlikely. Jorge, Slegers and Enns have a bit of MLB experience but neither would be a credible choice to open the season in the Twins rotation. Gonsalves and Romero would be more legit choices, and are very close to ready, but they need prove themselves (and their shoulders) in Triple-A. But all five are on the 40-man roster (as is Littell) so it's not impossible that one could find his way into the picture. After all, Mejia had almost zero major-league experience last spring when he won Minnesota's fifth rotation spot. 4. Should the Twins Be Shopping Pitching Prospects? This question is sort of inevitable after looking at all the angles. Unless multiple prospects being discussed here get hurt, move to the bullpen, or make the big-league team, the Twins are going to be facing a real numbers crunch with their almost-ready starters. The old saying about how "you can never have too much pitching" isn't exactly true. This situation will be a substantial factor in how the coming offseason is handled. Flip quantity and upside for quality and readiness. If the Twins could package a couple of these arms and get back a quality addition to the MLB rotation, it would kill two birds with one stone. The problem is that it's risky. You've got to really trust your evaluations. Minnesota can ill afford to let one of these guys fulfill his potential elsewhere while getting back a few years of fairly expensive league-average performance from, say, Jake Odorizzi. Take a pass on the bloated starting pitching market and let the kids take the reins. Go with a rotation of Erv, Berrios, Gibson, Mejia and [OPEN] with the final job being up for grabs among a wide cast. If the Twins truly want to build from within, and have belief in their group of young arms, then this would be the logical path. But it's not exactly one that thrusts your team forcefully into championship contention. We'll see how it plays out. This could be a point of divergence between the new mentality and the old. I suspect Terry Ryan's regime would have leaned toward the latter approach, while the Falvine Machine might opt for the former. I don't know if they're all that sold on this crop of pitchers – all good enough to be genuinely interesting assets, but not one a true top-tier prospect in the game. May, Gonsalvez, Romero, Littel, Slegers all need to be in the AAA rotation.It will be interesting to watch how the crop turns out.Mejia/ May/ Romero/ Littel have all had the is his best future in the bullpen question posed of them as prospects.Stewart and Slegers seem to be of the Brian Duensing/ Anthony Swarzak 6th starter or long guy mold. I can just picture Twins Daily before the 91 season.Erickson did well at the end of 90 but he is still unproven and could use more seasoning. Tapani is 27 years old and has only pitched a handful of games at the major league level.Morris is in the twilight of his career coming off two mediocre years. This is not exactly a rotation that thrusts a team forcefully into playoff contention. Don't even get me started on 87. Why not rely on guys to step up? I could easily see Gonsalves following the path of Kyle Hendricks.Why expect guys who have dominated at lower levels to fail in the Bigs? Twins won 85 games and much of the 2nd half had Colon, Segers, Gee and half a dozen others filling the role of 4th and 5th starters.No matter who we go with it will look better on paper than the start of 2017 and way better than the end .. Why not believe the results will be better also? The way I see it, the rotation is Santana, Berrios, open, open, open. I have no idea if the FO feels the same. So with possibly three spots open, there should be no worry about signing or trading for one guy. Gibson shouldn't be a lock. Mejia shouldn't be either. Hughes and May I expect nothing from. Anything is a bonus out of those two. Well, I should say anything good is a bonus. We've been worrying about the BP crunch for years now and those players keep getting hurt or are ineffective. Same thing can happen in the rotation. The Twins lost three guys from the MLB rotation last year, which is probably one too many to be prepared for, but there certainly wasn't a crunch last year. I don't think we have a problem yet. We just keep worrying about a possible problem. Improved health and pitching well would change that, but how often has that happened to the Twins in recent history? And someone like a Gibson shouldn't block a better pitcher if that situation presents itself. Based on how the season goes or how many pitchers are acquired Santana may not even be here for much longer either. This is what Falvine wanted when they traded for Littell and Enns. And the guy they got from the Nationals. (Can't think of his name currently) Twins need/ed a stronger 2nd and 3rd level of pitchers. Now they are seeing that come together. Hopefully they can help the Twins win it all in '18! Nice problem to have, Nick. And I will add one more to the mix.Don't know his name, but I will be shocked if the Twins don't sign one major league starter to a minor league contract.This year's version of Dillon Gee. So that gives you seven, not including Stewart.I wouldn't be surprised if both Little and Romero begin their season in AA, moving up to Rochester as injuries take their toll at AAA or with the Twins.If everyone is healthy and no one opens with the Twins, someone like Enns will need to move to the pen. The MLB/AAA/AA logjam exists only as long as everyone stays healthy. One injury makes things less tight, and two completely eliminate the issue. What do you think the odds are that everyone reaches Opening Day ready to pitch? We call it a logjam, but it's a logjam of mediocrity (at best) with guys 3-10.We still aren't close to a legit rotation, not one that any other team will have any concern about facing when playoff time rolls around anyway.When we can pencil in a rotation and say, Santana, Berrios, open, open, and open, that only says that we don't have any answers after them. C'mon Falvine, make some moves!I'd be so thrilled to see two or three of these guys moved for one guy that we KNOW we can pencil in, whether its a starter or in the bullpen. I would be surprised if Littell and Romero both go back to AA. All I know is that these guys May face a Kohl group of Stephen better Slegers in the Majors, so I hope we do more than a Littell to figure out something to make Enns meet. Outside of Gonsalves there would be no problem with anyone else starting in AA. But admittedly moving Slegers back would be pointless. If the front office does it right, Mejia should start in AAA too. I'm glad the standard for Twins' rotation seems to be moving from "opening the season" to "competing for the division" toward "winning in the playoffs". Those are really different measures and really important to gauge correctly. Romero is still only entering his age 23 season and has pitched 24 games in Double A, Littell will be in his age 22 season and has only pitched 14 games in Double A. I don't see any reason to feel the need to bump those guys up right away to start the year. Can always move them up during the year if needed. Great stuff as always, really shows Falvine are in a good spot. Sounds like they may have the financial flexibility to sign a guy or two and at the same time they have depth to use as either injury insurance or trade bait. Obviously trades/Rule 5 draft stuff and injuries could open up spots, but I'd suspect the team will also sign at least one minor league free agent to add to this mix too. But the fact they let Dereck Rodriguez and David Hurlbut go says they feel pretty comfortable with their depth in the upper minors. There are arguments for all those guys I listed in the AA rotation to be in Rochester, but the five guys I listed in the Red Wings rotation need to be in AAA (though I am interested in Nick's idea of Enns in the pen). I don't think it would hurt any of those guys listed to go back to Chattanooga. Looking down into Fort Myers, I don't see anybody that really needs to move up to AA start the year. Thorpe only made 15 starts there and is still going to be building innings, nothing wrong with him going back to the FSL as a 22-year-old to open the year. If they only ended up adding one MLB SP, Mejia moves up to the Twins, Jorge moves up to Rochester and somebody like Randy LeBlanc or Sean Poppen enters the Chattanooga rotation. Phil Hughes is going to need to fit in somewhere too (Triple A bullpen until he's 100% healthy?) and I'm sure I'm forgetting somebody else. Won't they have same problem in AA this year? With those two down and Stewart, Thorpe, Wells and others? I think the average player in the FSL is something like 23-years-old, so Thorpe and Wells would still be young for that level. Also, neither of those two have pitched healthy through an entire year of full-season ball yet. I would feel comfortable starting the year with both of them on the Miracle. Ironically, adding an impact starter will make it even harder for the guys down in Rochester right now. I believe the new regime's evaluation to go and deal some of them and I believe that's the way to go. As good as most of them are, it's going to be nearly impossible to find room in a rotation that has Erv, Berríos and, say, Darvish? Mejía is supposed to make a Berríos-like leap from his rookie season next year, so you know he's probably staying put, too. And if Gibby keeps up that post-ASG type of game, then all doors will be closed. I agree. Would be a really aggressive push for both of them to start AA. With the lack of the full season, probably makes sense to ease them into the year. If they dominate early they can be promoted pretty quickly. Certainly there will be some movement ahead of them in the system. Is there any advantage to starting a pitcher coming off of injury (May - Tommy John surgery) in a warmer climate like Chattanooga or Fort Myers? Here is a partial list of pitchers (with age starting next year) competing for the rotation of the Twins top 3 minor leagues teams. This shows me we should be trading some for more top end talent or at this point there really is no reason not to switch some to relief pitchers. The pitchers with the best chance of having an impact on the major league team should be the priority. To say somebody can be held down because of age, tells me they aren't the prospect we are hoping he is. I'm going to have to agree with Tom on this one, though I am not convinced the Twins will add two starters. I'm still banking on one, with Mejia up and challenged by May, possibly. Though I am certainly open to that second starter and won't complain. But I also see a pair of quality pen arms added to the mix. I see Hughes on the DL or EAT followed by rehab assignments to begin the year. (Possibly the same for May, though the 5th spot or AAA seems more likely). These "logjams" seem to work out due to injury or a possible trade as well. I'm thrilled to have so many options, and feel pretty confident a couple of these guys will be ready at some point in 2018, and gain experience for 2019 and beyond. Only need a couple to "hit" to keep building the staff. And the depth is there to make that happen. Yes, and I believe all the rehab coordinators/a lot of the medical staff are based out of Fort Myers, so there could be some advantage to sending a guy down there if you were concerned about his readiness. On the other hand, if you do feel like a guy is ready, sending him to Rochester to test out how he handles the cold could be kind of an effective final checkpoint. Is he really ready to come back, or are there still stiffness/soreness issues popping up? So you think Slegers is more likely to be a good MLB pitcher than Thorpe?